Snacks or dessert? This pao’s gotchu. (SPOT.ph) First, we went crazy topping everything edible with four kinds of cheese. Then we filled our tummies with a variety of cheese tarts. Then, off we went to a new craving—2015 became the Year of the Ramen. Come last year, we developed a new appreciation for this favorite Pinoy side dish: we fused salted egg into all things good and tasty. Following this salted egg obsession, 7-Eleven came up with a new tasty treat. Introducing the Salted Egg Custard Pao. This sweet, savory snack can double as your dessert or merienda, or if you plan to eat more paos than a normal person would, this can substitute a full meal. Try pairing it with these while you’re at it. Just a slight whiff of coffee is enough to entice you and keep you awake. So, as every lethargic person's go-to drink, it automatically registers as heavenly no matter how it's served. 7-Eleven’s honest-to-goodness coffee is made of 100% Arabica beans freshly made in front of you. Down your salted egg custard pao with this, and feel the flavors swirl inside your mouth. No wonder some manufacturers are now selling salted egg-flavored potato chips. Salted egg tastes good with and on anything! Now try your favorite bag of chips with the new salted egg custard pao. Let us know how this trip goes. There was a time when milk tea was all the rage. What if we eat this new craze with the old? Will it be as addicting? Try for yourself. There's more to cheese, salami and chocolate spread. 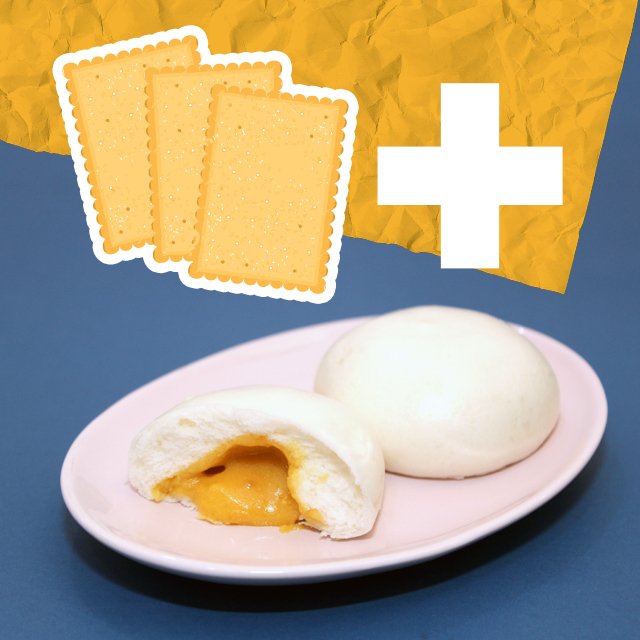 Amplify your midday munchies by pairing it with the salted egg pao. You can even try dipping your crackers into the yummy custard. Vanilla ice cream with the salted egg custard pao? Why not. Wait, why don’t we just eat this pao with everything?! For only P25, congratulations, you just found your new go-to merienda. Buy one or ten now!